Tridens flavus is a perennial C4 grass (Basinger 2002), 80 cm to1.5 m, tufted, sometimes with short rhizomes also, stems sticky near top, sheaths hairy at top, juncture with blade often red, ligule a dense band of very short tan hairs, less than 0.1 cm long. 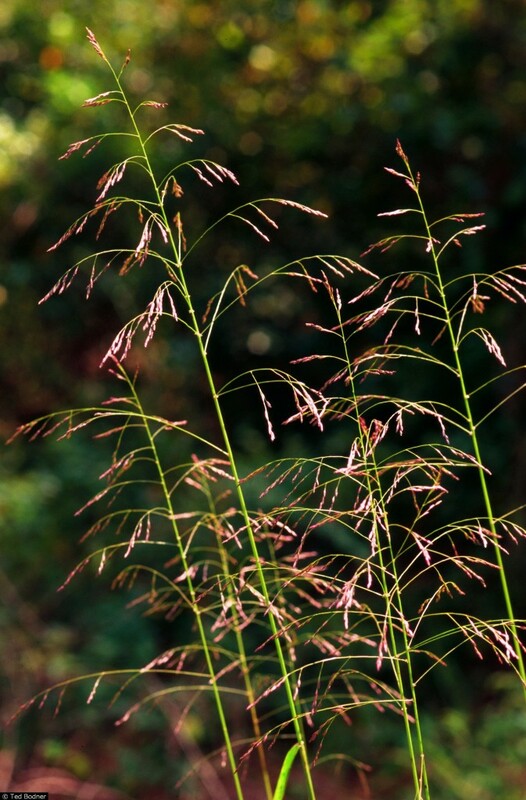 Leaves elongate, 0.3-0.8 cm wide, shiny dark green, tapered to slender tip, tending to roll inward. Flower spikelets 4-9 flowered, mostly towards outer half of major branches, 0.5-1.0 cm long, dark purple, shiny, lemmas densely pale hairy along base of margin; inflorescence dark purple, open, sparse, branches delicate, sticky, drooping, widely spaced; seeds eaten by some birds and small mammals (Martin 1951); blooms and fruits Aug.-Oct.
Habitat: open edges, fields. More common along roadsides, and grassy median strips, soil pH 4.5-6.5 (USDA, NRDC 2010). Notes: Apparently fairly salt tolerant. Plants shown to be infected by endophytic fungus Balansia epichloë (Clavicipitaceae), (Clay and Leuchtmann 1989).